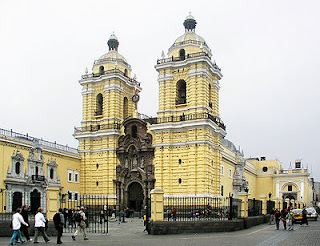 Lima is a city that rich in cultural, historical buildings and tourist sites of interest in Peru. 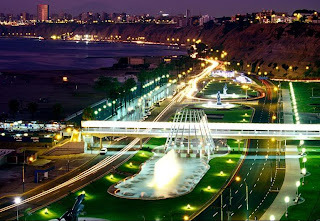 If you want a vacation to Peru's largest city,Lima City built on hills at 300 meters above sea level. The city is become exotic because a human habitat in the mountains, beaches and valleys that are at once in a single territorial Departemento de Lima. 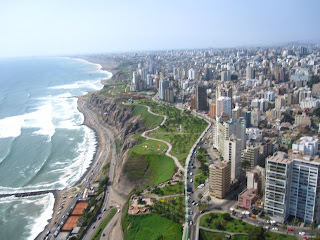 Lima city was founded in 1553 by the conquistador Francisco Pizarro from Spain. Lima city is designed as a block and very neat. This seemed like continue what was made by the Spaniards when designing the Centro de Lima. The old town is the landscape created by the block model with a lot of public spaces and open parks that they called the plaza. There plaza Saint Martin and Plaza de Armaz. 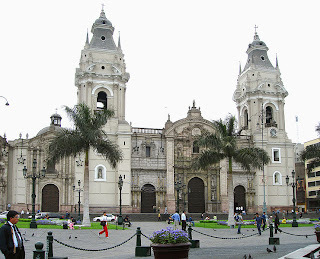 Plaza de Armas is the center of the historic district of Lima city. Cathedral, the Palacio de Gobierno, Archibishop palace, Palacio Nacional and other important buildings, can be found in this region. In addition to historical sights, you can also do a culinary adventure in a variety of restaurant or take the time to shop. 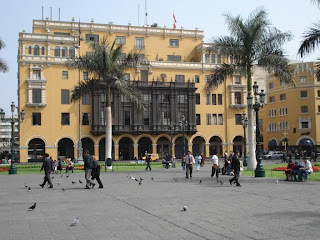 The location is also called the Plaza Mayor is the place where Francisco Pizarro founded Lima on January 18, 1535. Plaza Mayor is also surrounded by several major roads like Jiron Junin, Jiron de la Union, Jiron Huallaga, and Jiron Carabaja. This Roman Catholic cathedral located in the Plaza Mayor. Construction began in 1535 and this building has gone through a lot of renovation and change. At the front of the cathedral, you can see three large doors. The main door has a larger size than the other door . At least there are fewer than 14 a side door to the cathedral. An open one in Calle de Judios and others in the Patio de los Narajos. While at the back door there are two entrances, Santa Apolonia and San Cristobal. Class district that has a 9.62 square kilometer area is home to many wealthy Lima and popular location for hotel, restaurant and nightclub. Location of beaches known as Costa Verde is also attracting many local residents and tourists to relax during the summer. For those who like to surf, this beach area is a place worth visiting. Cerro Azul, or blue hill was previously a fishing village and also a commercial port in the province of Canete, Lima, Peru. 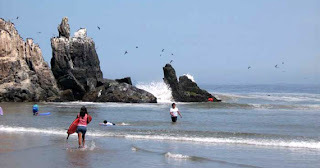 Located 131 kilometers south of Lima, the area is often visited in summer by tourists. Cerro Azul is a very popular beach resort. This region is also perfect for surfing activities. Here, you can learn how to surf or perfecting techniques in surf camps. 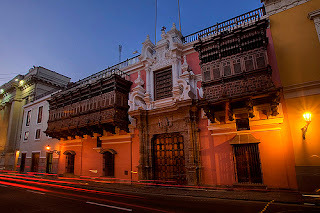 The palace is located near the Plaza de Armas was built in the early 18th century by Don Jose Tagle and Brachio. The building is embraced Sevillian baroque style with a strong Arab influence. The materials used in its construction was brought from Spain, Panama and Central America. In this building there is a beautiful and typical balcony. This building is now a State Department office. Parque de las Leyendas a zoo built among the ruins of pre-Incan city. This zoo has a collection of 2100 animals of 268 different species. Of those, 87 are mammals, 103 birds, 32 reptiles, 42 fish, and 4 amphibians. The animals are grouped according to three different natural regions of Peru, namely Costa (Coast), Sierra (highlands), and Selva (jungle). The zoo is located at Avenida Las Leyendas is open daily from 9:00 to 17:00 pm local time.